Alcano would make a good role model for anyone dealing with stress-related issues. 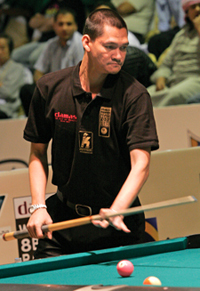 Personifying "loosey-goosey," the gangly Filipino appeared blissfully at ease while dispatching both finalists from the 2007 World Pool Championship - 10-8 against runner-up Roberto Gomez, and 10-5 against Peach. In the quarterfinals he faced Italy's Bruno Muratore, who had a head of steam after knocking off an unfocused Van Boening, 10-7. But Alcano shrugged him off as well, 10-5, securing a spot in the semis against countryman Orcollo. Seemingly in control at 8-4 and sprinting for the case game, Alcano lost traction by scratching in the side pocket. Orcollo came roaring back, taking five straight games and reaching the hill, 9-8. The alternating-break format threw Alcano a lifeline, allowing him to break and clear the table. Orcollo's dry break in the deciding game left him with nothing but a front-row seat for Alcano's winning runout. In the other half of the bracket, Souquet marched steadily to the final. 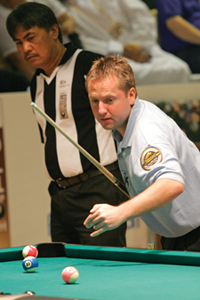 He handled Elvis Calasong of the Philippines, 10-7, before dodging a bullet against Niels Feijen of the Netherlands. The steely Feijen had the honors in the hill-hill game, but failed to sink any balls and left a wide-open spread for Souquet to sweep for a 10-9 win. A 10-3 victory against Chris Melling of Great Britain earned Souquet entry to the semifinals against Chamat. Souquet's scratch on the opening break kicked off a bizarre match, in which neither player seemed in total control of his game and the table turned temperamental. "The table started playing funny, with uncontrollable rail reactions, which made us look like beginners sometimes," Souquet said. Souquet missed an 8 ball in game 3, and another easy ball in the ninth game that would have lifted him to 6-3. The match teetered back and forth until Souquet straightened himself out and took a 9-7 lead. Chamat scratched on the next break, but Souquet's runout was far from easy. "The table reacted even worse at the end, and position play became more like flipping a coin," he said. "I went from one bad position to the other and came up with a bank shot on the 1 ball to finally finish the match." Asked about opponent Alcano in the final, Souquet didn't focus on the revenge angle as much as the difference in game from the world 9-ball event he lost to Alcano in 2006. "8-Ball is a different discipline, and strategy plays a larger role," he said. If his strategy was to play flawless pool, he succeeded. In the final, Souquet built an 8-3 lead in the strength of pinpoint position play and perfect patterns. Then he caught a case of the dry breaks. Failing to drop a ball in the 12th and 16th frames, Souquet watched his advantage dwindle to a single game, 9-8. Alcano had recovered with a series of gutsy plays, but stubbed his toe with a poorly executed shot in the 18th game that led to a missed bank. Souquet soon had a 10-8 lead with two games to go. Souquet sat all throughout the 19th rack, and then fell all the way through his defective chair in the next frame after checking the rack and returning to his seat. Getting over the sudden shock and shutting out the new pain in his posterior, he executed a textbook break and cleared the table for an 11-9 lead. With Souquet having survived his obligatory "bad break" occurrence, it was then Alcano's turn. Hoping to cut Souquet's lead to 11-10, Alcano misplayed a kiss on the 8 in the side pocket for his third miss of the match. Souquet punctuated his subsequent runout with a two-rail bank on the 11. And that was the game-changer. "If he would have won that game, the score would have been 11-10 instead of 12-9, and that's a big difference," Souquet said. "At 12-9, I had two breaks to win the match, and the pressure was only on him." One rack was all it took. The final 8 fell, and Souquet's arms shot to the ceiling. His roar, upward gaze and defiant victory pose appeared to announce to the universe, "You can't keep me down forever."